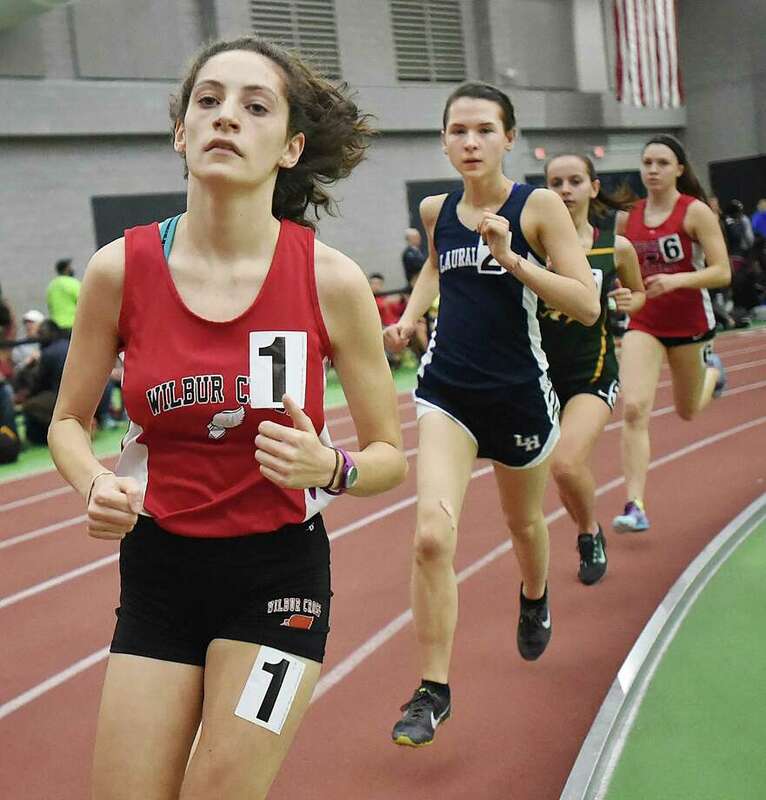 Wilbur Cross’ Grace Adolphe is the top seed in the 1000 entering Friday’s Class L track championship. Team contenders: The interesting item to note is two-time defending Class L champion Hall has moved up to Class LL this season, making this season’s L meet wide open. Windsor, which won the L title in 2015 and was runner-up in 2016, has some depth to be a contender. But the SCC is one league that could dominate with four individual top seeds and three top seeds in the relays. Teams that should enjoy success and potentially contend for a top team finish include Darien, New Milford, Xavier, Hand and Amity. Leading the way for Xavier are Pierre Sylvain (top seed 600) and William Curran (top seed 1000, No. 2 seed 1600). Other SCC athletes with top seeds are Richard Papa of Amity in the 55 hurdles and Ameen Parks of Hand in the 300. Leading Darien are Ryan Eppley (top seed high jump) and Kiernan Daly (top seed pole vault). Daly is the only one in Class L to qualify for the pole vault with a height of 13 feet this season. Eli Nahom leads New Milford with a top seed in the 3200. Nahom won the 3200 (9:55.33) and 1600 (4:36.67) at the SWC meet. Samuel Whitaker of East Lyme is the top seed in the 1600. Another top seed representing the SWC is Christ N’Dabian of Bunnell in the 55. Michael Browning of RHAM is the overwhelming favorite as the top seed in the shot put. Earlier this season Browning, who won the shot put (58-0.25) at the CCC meet, was ranked among the top five in the nation in the event. Leading the way for Windsor is Cori Richardson with top seeds in the 55 and 300. Individual top seeds for Wilbur Cross are Susie Okoli in the shot put and Grace Adolphe in the 1000. Adolphe won the 1000 (3:03.93) and Okoli won the shot put (39-10) at the SCC meet. Meredith Bloss and Sofia Migani are among the top Guilford athletes. Migani is the top seed in the high jump. Bloss, who won the 1600 (5:36.28) and 3200 (11:49.87) at the SCC meet, is the No. 3 seed in the 1600 and 3200. Another SCC standout is Erica Marriott of North Haven who is the top seed in the long jump. Among the top FCIAC athletes are Mairead Class of Darien (top seed 1600) and Shelby Dejana of Wilton (top seed 55 hurdles). Other top athletes include Brooke Morabito of New Milford (top seed 3200), Elsa Martin of Simsbury (top seed 600) and Haley Jaquith of E.O. Smith (top seed pole vault). Jaquith is the only girl in L to qualify with a height of 10-plus feet (10-6).